I know you'll remember I went to Italy for three weeks in the summer; if you know me in person you're probably sick of hearing about it by now. It's taken me a while to get my head around blogging about it, because it was just epic and we saw so many things. Over the next weeks and months I will fill you in on all the details - the scenery, the art, the food, the ice cream, all the important stuff. To start off with, here's a Google Map of all the places we went to. I have marked all the transport and accommodation places and I'm working on adding the places we ate the places where we ate (as many as I can remember, anyway - 20 days is a lot of meals out). As a fatty I always find talking about food ever so slightly awkward but, really, it was Italy, so there will be a lot of food pictures and chatter. I think food might be ruined for me forever now. To the left - replacing limoncello as my new favourite Italian drink: an Aperol spritz, served to me at a pavement cafe in Milan, where we whiled away an hour watching the well-heeled and the tourist trip by. 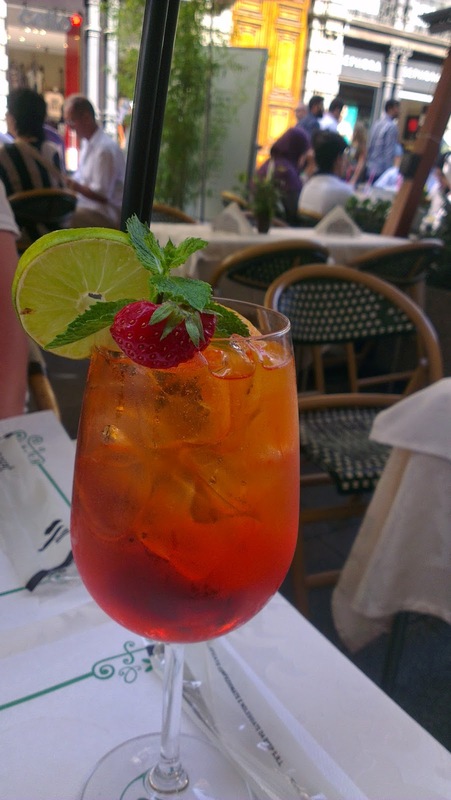 An Aperol spritz is made from equal parts Aperol (like a less potent version of Campari), Prosecco and soda water, and seems to be the Italian version of Pimms. Since I love Campari and also Prosecco, this was a complete win for me. I've now got a bottle of Aperol on the shelf downstairs for when I feel like reminiscing. The Italians gather in pavement cafes to drink this, always from big rounded wine glasses, in the early evening but, truthfully, the earliest I saw them being drunk was around 11am. Love it. It really never is too early for Prosecco.